"When you implement a new technology in your organization, look at it thro' a customer lens"
Recently, I had a chat with Kate Visconti, Managing Director of Acumen Solutions, USA who takes care of the Sales Acceleration and Change Management Practice. She is also an Adjunct Professor with Santa Clara University, USA. It was an interesting & engaging conversation and here are the highlights of the discussion. What was interesting to me was the points she made for successful adoption of technology in an enterprise - the importance of business process re-engineeering, change management as much the software or technology selection & upgrade itself and looking at the implementation itself thro' a customer lens. I have believed for many years that these were the most critical aspects when it comes successful technology adoption & usage and often enough importance & attention is not paid within the organization and the stake holders to this area. Kate brought this out beautifully and reinforced this very well during our conversation. Swami: How do you approach a technology implementation and what do you believe are key differences that you or your organization focuses on? Kate: We always start any technology implementation with a first principle approach - how is the enterprise and their stakeholders currently thinking, feeling and doing with their workflow right now. We strongly focus on process innovation and not a run-of-the-mill implementation like other system integrators. We conduct multi-day workshops, build customer personas, enable collaborative conversations across cross-functional groups to understand current issues and identify opportunities for optimization and automation. For us change management is as much important as the technology implementation itself. That's a key difference we believe we bring to the table & where I have seen successful technology transformation happen. Swami: When it comes to selecting or shortlisting technology platforms or software etc. and adopting technology across the organization, which are areas that are normally missed by them in your experience? Kate: Most of them don't have an 'outside-in' approach and we bring that to play when we work with organizations. When a tech platform or software is selected, there is a lot of discussion on features, benefits etc. but very often during implementation, they don't see the technology from a customer's lens. We do a lot of shadowing to know how the current processes work, do customer research, customer experience benchmarking and often these are areas that are not often not given enough attention or missed most often. Swami: Enterprises spend millions of dollars on acquiring licenses for tech & software and you have seen many successful technology implementations, adoption and transformation across enterprises, what do you believe is the secret sauce for their success? Kate: What I have seen in enterprises where there have been successful technology transformation or adoption is that if there is an Engaged Executive Sponsor, the chances of success improve by at least 2 times! An engaged leadership committee which defines the vision & organizational priorities makes the next difference in the success as the technology road map, business outcomes and priorities get defined well. Engaged Stakeholders make the next difference - end-users, managers, executives, customers as they influence adoption and validate user experience across the enterprise. These I believe are the secret sauce to success and where I have seen this happen in organizations, things have been successful most of the time. Swami: You also emphasize a lot on hand-holding the enterprises which your organization does after you implement the technology or software. That's a very interesting point that you make and in fact what kind of metrices do you track and for how long do you suggest one must do this? Adoption - Quality of inputs that go into using the software or technology within the enterprise after roll-out - Timeliness, Completeness of the information, Not just no. of log-ins but demonstration of new user benefits and referrals etc. Business before vs Business After - Benchmarking and looking at % increase in agreed business metrics, % decrease in, say, sales cycle or service cycle reduction etc. These are some of the sample key metrices one should look at. Swami: There is often an underestimation of the services costs which enterprises need to spend to make the technology transformation successful. There is a lot of focus on licenses fees, infra needed, maintenance & renewal fees etc. but much less attention is paid to services & costs associated with it. Right? Kate: I totally agree with you, Swami. In my estimate, these may vary by project scope, complexity and these are directional just to give you a perspective that enterprises need to factor these services cost for a successful technology transformation - up to 30-40% factor for change management, engaged leadership, customer research, building alignment workshops, post implementation program adoption costs etc. These are over and above license fees and customization costs they would incur during the course of a 3-4 year project or program. Swami: I saw that right at the start of our chat, you mentioned don't treat it like an IT project. What did you mean by that? Kate: I often quote from the point made by Forrester Research Chairman and Chief Executive Officer George Colony made on technology projects, that in this age it is transforming from IT projects to Business Technology projects thinking. This is a key difference to successful technology selection, implementation, adoption and usage. I also say - Don't treat it like an IT project but treat it like a customer project! These three - Deep Learning, Personalization and Privacy are indeed oxymorons. The fact that when they come together for contextualization, relevance and differentiated customer experience - privacy takes a back seat! When Privacy takes centre stage, then Deep Learning & personalization take a backseat! The real question, is from a customer point of view, can they work in harmony? How do companies use them effectively? What deep learning can do is well documented. When you listen to this talk by Jeff Dean on Large scale deep learning at Google, you will realize the power of its capability. The most important difference you will see is how Google has embedded that in its products and services.This then brings the issue of privacy to the center of the debate, as this is the data of the customer that Google analyzes & monetizes. However, when it comes to the synergy between Deep learning and personalization, all the data that is used to understand this customer, effectively means personalization can be done like never before. So, the next time you walk-in to your favorite store, or your bank, or your online store, or your health care provider - the personalization possibilities thro' virtual assistants can create a phenomenal experience to the customer. Hence, if deep learning helps customers make their life simpler, then what's the problem with privacy? I think if this is done with the permission of the customer, then puts to rest the debate. However, this has a lot of learning for the other industries - as the customer pays and owns their products, unlike Google where products are sometimes used for free. Take for example an automotive brand - the applications of deep learning, personalization is phenomenal. With most cars fitted now with navigation systems and telematics devices, the data this can throw about the customer, their driving habits into their automotive platform is phenomenal. The driving habits, the engine data, travel data, innovative use of public data all represent great deep learning application opportunities for the automotive brands to drive personalization & differentiation. Here, privacy is something of little consequence or debate as any assisted customer service will only enhance the customer experience. The same goes with banks - where the usage of the mobile app, online banking, payment apps, shopping data thro' credit cards, public financial data etc. will only create opportunities for deep learning applications and personalization for enabling personalized financial solutions. The question really is not will they but they will have to do it soon. Many times I have been in a meeting with angry marketers, designers, or agency account managers because I was demonstrating that their ideas didn’t work. Didn’t work for the business that is. Meeting quantitative goals online, when you take the pain to define them, is something very hard to do; amazingly, people tend not to behave the way we would like them to! To me, people who think measurement kills creativity simply have problems handling accountability. Businesses constantly face problems, and finding solutions to those problems is when creativity is at its most useful. Creativity performs best under pressure, and it’s measurement’s role to apply it. I could not agree more with some of the points made here not just for online marketing but for any multi-channel marketing program. I think there needs to be a right balance between measurement and creativity across all media vehicles - TV, internet, direct mail, email, mobile, social media etc. Just blind measurement focus, tends to reduce the "need to experiment mindset" as everybody who is involved with the marketing programs then is worried about results and never try to innovate due to fear of failure. While on the other hand just being creative tends to be a silo and self-fulfilling proposition where there is very little 'acceptance of accountability'. Hence, there is a defensive approach to results and there always tends to be a blame game on how results were not truly measured, the metrics used was wrong etc. I used to, in my earlier job, talk of concept of the need for "IMAGINACTION" in marketing programs - where imagination without action and action without imagination, has no place in marketing programs. The account managers and marketers need to do both if customers need to be involved and engaged with their programs. Joseph Jaffe makes some incredible points in his new book Flip The Funnel. Instead of “ending” all outreach efforts at the point of customer purchase, why not use this moment of truth to kick relationship building efforts into high gear? For some reason, most auto brands become goldfish the moment their customers drive out of their showrooms with their new leased car. Out of site. Out of mind. Acknowledgment – everything from courtesy follow-up calls to period check-ins; calls on birthdays; updates on new accessories, technology patches. And then again there are the two most powerful words in the English language, “Thank you” (there’s also I’m sorry but that’s another story for another day). The other day I went into a local bank to apply for a loan. My contact made a point to introduce me to the owner of the bank. When last did you meet the owner of your local dealership? Do you even know who they are? Or more importantly, do they even know who you are? Dialogue – Does your local salesperson have a Facebook page? Maybe they should? What about the brand itself: are they active on Twitter? Does that even mean anything? More importantly how do they escalate or route queries or concerns to the right and relevant parties? In the automotive world, there is a gaping chasm between sales and service (support). Not many companies or brands have mastered the art of treating retention as a form of acquisition. They neither have templates nor a follow-up plan of how to leverage this. This either ends-up in poor investments in retention or even if they invest in retention programs, there is no organized method of building a value out of the efforts that are put in. Hence, the results are neither measured nor made a part of the overall enterprise-wide initiative. Remember, retention cannot be made a department responsibility or accountability but needs an organization-wide ownership. This has catalytic effect on acquisition because of better word-of-mouth, better customer experience, better customer feedback gathering and resolution across departments. When is your company ready to treat retention as a form of acquisition? Make it happen today. Michelin's famously anonymous intrigue misses a trick or two! Michelin has come-up with lovely idea to connect with their customers - famouslyanonymous.com. This is a great case for open-source marketing! This is perhaps how marketing will be done in the future for many brands. The Michelin guide was first published in France in 1900 as a free directory that offered listings of hotels to promote road travel which would in turn help sales of Michelin brand tires. By 1926, they started charging for the guide and also started rating the restaurants. Michelin has its secret reviewers going into restaurants and giving them a 3 star rating to them based on their experience. Now, they seem to be making the identity of these reviewers public and therefore giving it a lot of credibility. I had visited the website as it generated a lot of interest in me due to high decibel PR. While the campaign seems to be at a teaser stage just now, the website had some interesting content around the history of the guide etc. I wanted to see the interview with the inspectors section and it asked me to comeback on Oct 5th. This is where they I felt they got it all wrong and dropped the ball! Interview Alert: They could have asked me to register for the interview alert with inspectors as and when it happens on the site. A simple and easy trail that I could have left behind - build a prospect database for the guide. I would have gladly agreed to do so. Oct 5th is quite a long way off and I might just forget to revisit the website amongst my other commitments. Hence, the engagement needs to be at the behest of the brand and not leave it to chance of my coming back. E-book Track: Having come-up with a great story on the heritage of the guide, there was an interesting opportunity that seemed to be available - to capture my identity to build a dialog further. Brands need to understand conversations like this happen over multiple touches with consumers. The heritage story has interesting levers to "extend the conversation"! Leveraging the power of multi-channel for trial: There is a huge opportunity for this campaign to use a multi-stage, multi-channel campaign approach which seems to have been missed. There is a great case for using mobile marketing by registering the vistors' mobile numbers and texting them on "interesting happenings on this website or restaurants" when they are not on the net. Also, if consumers don't pre-book, there can be a trigger for the 'trial' of the guide. Consumers could use mobile texting(SMS) or email alerts to know more about a particular restaurant of their interest and their rating. This could act as a "sampling" for the new guide and encourage more purchase interest in the guide. This will open-up new opportunities for dialog and a continous one too. In the world of open-source marketing and web conversations, there is a need to look at building the dialog thro' bits and bytes all the time. One must be able to link every "customer interaction chain" into a next step that can fulfil a behavioural objective - reinforce, reopen the dialog, inform, reiterate etc. and this is critical if the campaign objectives have to be met. Here's a lovely article by Jessica on how customer experience is set to become the cornerstone for successful companies of tomorrow. According to me, the actionable items - going beyond lofty beliefs and intention, that need to be taken have been summarized very well in this article. The questions companies need to ask themselves are simple and easy to get answers for, in terms of how well they do on these parameters. Did the interactions meet your needs? How easy is the company to work with? How enjoyable are these firms to work with? Obsess about customer needs, not product features: Adding this gadget or that widget may look cool, but if the "innovation" confuses the customer, the entire purpose is lost. Temkin encouraged the audience to engage in a "LIRM"-ing process: listen, interpret, react, and monitor. These elements, he said, are critical to developing a program to capture the Voice of the Customer. Reinforce the brand with every interaction, not just communication: Every employee in the company needs to understand the brand message and the brand promise. Every interaction should be based on this promise, a promise that must be insulated from damage when times get tough and cuts need to be made. Treat customer experience as a competence, not a function: Customer service is everyone's priority, not just that of the contact center. Call it "customer experience," "customer advocacy," "customer insight—anything, Temkin pleaded, that avoids dumping it into a siloed department. "The customer experience team cannot be another ‘function,' " Temkin said. "The group has to remain as a support to other parts of the organization." The leader of this group, he added, can be anyone — the CIO, the CMO, the COO — but the person cannot be more than two levels under the CEO. More important, whoever leads the group must possess enthusiasm about the cause — and be a champion for it. Level 1: Interested (19 percent) - customer experience is important, but funding and upper-level support is minimal. Level 2: Invested (22 percent) - customer experience is important and initial programs are being put in place -- but the effort is still not connected with profitability for the organization. Level 3: Committed (11 percent) - customer experience is critical to the company and executives understand how it's connected to fundamental results: It's not customer experience for customer experience's sake. Level 4: Engaged (8 percent) - customer experience is a core part of the company's strategy and objectives. Level 5: Embedded (4 percent) - it's in the company's DNA, the essence of everything and anything the company does. HOW does a carmaker unlock the door to reaching distracted, elusive customers in an increasingly competitive category? Nissan North America is hoping the answer may lie with, um, keys. For the promotion, 20,000 key rings will be deliberately “lost” in bars, concert halls, sports arenas and other public places in seven large markets. Each key ring will have three keys, all real, and two tags. The biggest key resembles a car key and the other two look as if they could fit the locks on house or office doors. One tag declares, “If found, please do not return,” because the Altima “has Intelligent Key with push-button ignition, and I no longer need these,” a reference to the technology that allows an Altima owner to start the car by pressing a button on the dash rather than inserting a key. The same tag invites the finder to learn more about the ignition system by visiting a section of the Nissan Web site (nissanusa.com/altima). 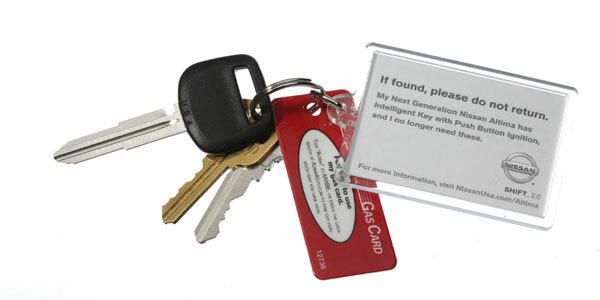 The other tag, labeled “Gas Card,” resembles the plastic keychain devices for electronic payment sponsored by service stations like Exxon and Mobil. The tag offers the finder of the key ring a chance to enter a sweepstakes, either by sending text messages or visiting another Web site (altimakeys.com), which is to be available this week.